Maria Salomea Skłodowska-Curie, (Warsaw 7 an t-Samhain 1867–Passy 4 an t-Iuchar 1934). Rugadh i ann an Warsaw, anns a' Phòlainn, agus chaochail i anns an Fhraing leis an aillse. Bha i na h-oileanach ann an Warsaw, Kraków, is dh'imrich i do Pharis ann an 1891. Phòs i Pierre Curie ann an 1894 is chaidh i na h-àrd-ollamh fiosaigs ann an 1906 nuair an do chaochail e, is na stiùiriche an deuchainn-lann Curie san Institiud Radium ann an 1914. Còmhla ri Pierre Curie lorg i polonium agus radium. Bhuannaich i an Duais Nobel ann am Fiosaigs ann an 1903 agus an Duais Nobel ann an Ceimigeachd ann an 1911, a' chiad thè a choisinn na duaisean sin a-riamh. Gu h-iongantach, bhuannaich a nighean, Irène Joliot-Curie agus a mac-cèile, Frédéric Joliot-Curie an duais seo fhèin ann an 1935. Chaidh an eileamaid cheimigeach curium ainmicheadh oirre is air Pierre Curie. ↑ “Marie Curie - Biographical”. Nobel Media AB. Air a thogail 4mh dhen Iuchar 2018. ↑ “The Nobel Prize in Chemistry 1911”. Nobel Media AB. Air a thogail 4mh dhen Iuchar 2018. 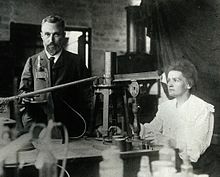 Air a tharraing à "https://gd.wikipedia.org/w/index.php?title=Maria_Skłodowska-Curie&oldid=545982"
Chaidh an duilleag seo a dheasachadh 19 dhen Mhàrt 2019 aig 11:30 turas mu dheireadh.